Copyright 2012 Penerbit Universiti Sains Malaysia. 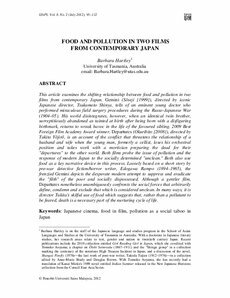 This article examines the shifting relationship between food and pollution in two films from contemporary Japan. Gemini (Sôseji ), directed by iconic Japanese director, Tsukamoto Shinya, tells of an eminent young doctor who performed miraculous field surgery procedures during the Russo-Japanese War (1904–05). His world disintegrates, however, when an identical twin brother, surreptitiously abandoned as tainted at birth after being born with a disfiguring birthmark, returns to wreak havoc in the life of the favoured sibling. 2009 Best Foreign Film Academy Award winner, Departures (Okuribito ), directed by Takita Yôjirô, is an account of the conflict that threatens the relationship of a husband and wife when the young man, formerly a cellist, loses his orchestral position and takes work with a mortician preparing the dead for their "departures" to the other world. Both films probe the issue of pollution and the response of modern Japan to the socially determined "unclean." Both also use food as a key narrative device in this process. Loosely based on a short story by pre-war detective fiction/horror writer, Edogawa Rampo (1894–1965), the frenzied Gemini depicts the desperate modern attempt to suppress and eradicate the "filth" of the poor and socially dispossessed. Although a gentler film, Departures nonetheless unambiguously confronts the social forces that arbitrarily define, condemn and exclude that which is considered unclean. In many ways, it is director Takita's skilful use of food which suggests that, rather than a pollutant to be feared, death is a necessary part of the nurturing cycle of life.